One of the most important determinants behind a company’s decision to offshore production is the cost of starting a business in another country, also called the ‘cost of entry’. This is the ‘fixed’ cost firms pay to operate a business in a given location. This cost is heavily affected by local policies, legislation, and regulation of several types. The lower this cost, the higher the incentives to offshore production to a certain destination. The hypothesis that firms' offshoring depends on the size of the entry cost is well known in the field of international trade (Ottaviano et al. 2018). However, little is known about the determinants of these costs. Do countries' policies and institutions represent entry costs that affect firms’ decisions about where to offshore? Which institutions and policies are more relevant? Only few papers tackle this question. Olney (2013), for example, analyses the role of employment protection legislation on the probability of offshoring. Antras et al. (2009) focus on institutions that produce different levels of investor protections and capital market development. In a recent paper, we analyse how a broad set of institutions and policies in the destination country affects firms’ offshoring decisions (Moriconi et al. 2018). We look at employment and investor protections in potential destinations and we also consider indices of corruption and measures of business bureaucracy. This set of measures captures the relevant ‘rules’ and their enforcement in a country. We then also explore whether a network of foreign workers from a specific country working in a firm can help that firm reduce asymmetries, uncertainties, and the entry costs of venturing abroad, to increase the probability that they offshore. Foreign workers have connections and knowledge of the business environment in their source country that could be extremely useful. The firm may draw on this expertise and this will reduce the costs of offshoring to the immigrant's country of origin. We use World Bank data on institutions and policies (the Doing Business and World Governance indicators) for approximately 160 destinations over the 2006–2012 period to proxy for country-specific entry fixed costs. The Doing Business indicator includes regulations in the areas of business (e.g. the time required to start a business, the time to export goods), credit (e.g. credit access, the rate of insolvency) and labour (e.g. employment protection legislation, minimum wages). We aggregate the measures of regulations within each area into one index using a principal component analysis. Such an index summarises the entry costs implied by regulations in each specific area. The World Governance indicators, then, provide information on a country-specific measure of perceived corruption, which is an important institutional cost, as it may subject the investor to uncertainty, bribes, or threats. These country-level indicators are then combined with a rich linked-employer-employee dataset, which includes information on approximately 2,000 Danish manufacturing firms over the 2006–2012 period. For each firm, we identify the extensive margin of offshoring (i.e., whether the firm offshores production to a certain destination in a given year). We also have detailed information on firms’ characteristics that allow us to control for firm features and to measure the number of foreign employees from each country, which captures the bilateral network size for each firm and country pair. 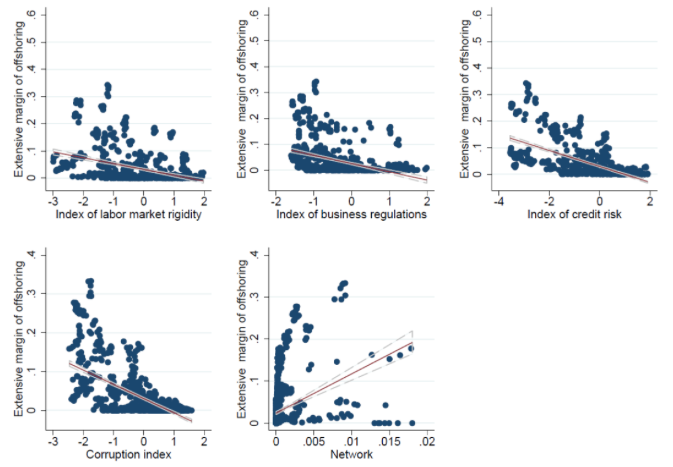 Figure 1 shows separate scatter plots of our indexes of labour market rigidity, business regulations, credit risk, and corruption, against the extensive margin of offshoring aggregated at the destination–year level. Each policy–institutional variable is measured so that an increase in value implies higher entry costs. A statistically significant negative relationship is evident between the indexes and the average share of firms that offshores at the year–destination level. The number of offshoring firms is negatively associated with measures of the institutional fixed costs for each country–year. This is consistent with the notion that institutionally driven fixed costs have a negative effect on the extensive margin of offshoring. The opposite holds for the network variable. A strong bilateral network of immigrant workers encourages firms’ offshoring. This is consistent with the idea that such a network reduces the fixed costs of setting up an offshore enterprise. Notes: The share of firms that offshore at the year-destination level are reported on the vertical axis. The index of regulations or the network variable at the year-destination level are reported on the horizontal axis. Institutional costs and immigrants’ networks: What matters for the offshoring decision? A more rigorous empirical analysis, where we fully take advantage of the richness of Danish administrative data, confirms the descriptive evidence presented in Figure 1. Quantitatively, our regression analysis suggests that the effect of institutional costs and networks on the probability of offshoring are sizeable. A one standard deviation increase in the index of labour market rigidity (e.g. going from the level of Austria, at about the median of the country distribution, to that of Portugal, whose average index is at the 95th percentile of the distribution) decreases the probability that a Danish manufacturing firm offshores in that country by roughly 20%. The impact of credit risk is approximately half this amount – the firm's probability of offshoring is reduced by 10% for each one-standard-deviation increase in the related index (e.g., corresponding by a move from the level of credit risk in Germany, to that of Macedonia). Corruption negatively affects the probability of offshoring, although the effect is smaller – an increase in the corruption index from the level of France to that of Azerbaijan (which corresponds to a one-standard-deviation increase in the corruption index) decreases the extensive margin by approximately 3%. As a partial exception, business regulations do not emerge as a significant determinant of firms’ offshoring behaviour. Another important dimension is the composition of the firm’s network – the positive effect of the network on offshoring provided by white-collar workers is about seven times larger than that associated with the blue-collar workers. The reason could be that foreign managers and professionals bring with them destination-specific knowledge that can promote offshoring activities in their country of origin more effectively than their blue-collar counterparts. Interestingly, ‘poaching’ experienced managers from other firms also has an effect on offshoring. The previous exposure to country-specific offshoring gained by managers in previous firms improves the bilateral extensive margin of offshoring of these managers' current firms. These results are consistent with the evidence found on firms’ export outcomes (Mion et al. 2017). These results contribute to the ongoing debate on the welfare effects of regulatory institutions. The economics literature has mixed views on the subject. Most studies find overly high costs of regulatory institutions, associated with lower competition, and larger local rents, particularly in the product market and in the labour market (Djankov et al. 2003). Some studies challenge these views and recall that regulations are primarily meant to protect the welfare of consumers and workers (see Arruñada 2007). We find that institutional costs are very important determinants of firm offshoring activities. These costs may arise because regulations are too pervasive, or because they are too weak. Our results are consistent with the view that labour markets are generally overregulated, which increases production costs and thus reduces firms’ incentives to offshore production. On the contrary, other important areas for business activity such as protection of credit and investments and control of corruption seem important to make countries more attractive to foreign investors. A network of immigrant workers at the firm level is another important way to attenuate costs associated with weak institutions. Antras, P, M A Desai and C F Foley (2009), “Multinational firms, FDI flows, and imperfect capital markets,” Quarterly Journal of Economics 124(3): 1171–1219. Arruñada (2007), “Pitfalls to avoid when measuring institutions: Is doing business damaging business?” Journal of Comparative Economics 35(4): 729–747. Djankov, S, R L Porta, F L de Silanes and A Shleifer (2002), “The regulation of entry,” Quarterly Journal of Economics 117(1): 1–37. Lu, Tao and Zhu (2017), “Identifying FDI spillovers,” Journal of International Economics 107: 75–90. Mion, G, L D Opromolla and A Sforza (2017), “The diffusion of knowledge via managers' mobility,” CESifo, Working paper series no 6256. Moriconi, S, G Peri and D Pozzoli (2018), “The role of institutions and immigrant networks in firms’ offshoring decisions,” CESifo, Working paper no 7312. Olney, W W (2013), “A race to the bottom? Employment protection and foreign direct investment,” Journal of International Economics 91(2): 191–203. Ottaviano, G I, G Peri and G C Wright (2018), “Immigration, trade and productivity in services: Evidence from UK firms,” Journal of International Economics 112: 88–108.